A few years ago, my dear friend Babz Chula died. We were friends in real life, and we were also Facebook friends. I remember visiting her FB page after she died and leaving her messages there, telling her I missed her. It was the digital equivalent of all the times I went to visit my mother’s grave. And I wasn’t the only one. Many others would visit her page and leave her little notes. 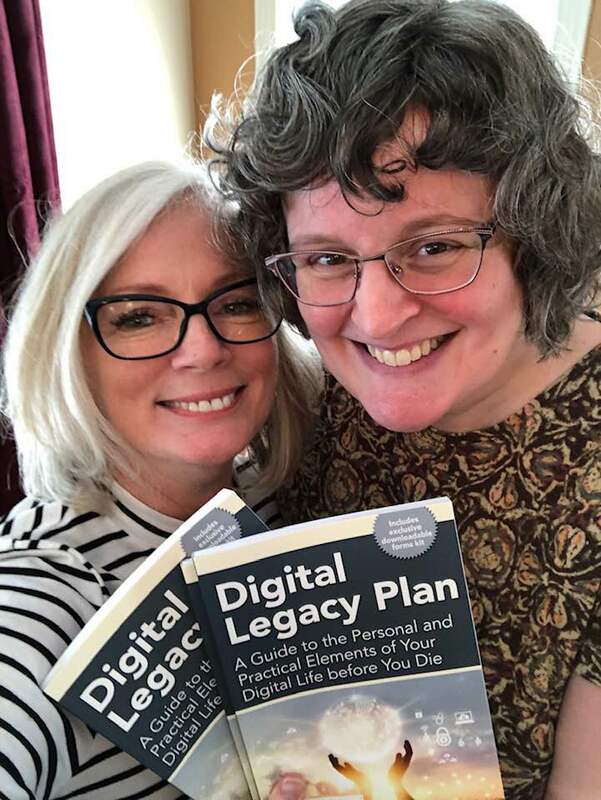 My dear friends Vicki McLeod and Angela Crocker have written a book about this emerging topic called Digital Legacy Plan: A Guide to the Personal and Practical Elements of Your Digital Life before you Die. I have a pretty large online presence; I have authored multiple blogs, I have been on Facebook and Twitter for 10 years, and I have 8 years worth of photos on Instagram. That’s a lot of stuff! What I love about these things is that they are creating a kind of digital scrapbook of my life, which I love looking back on (and sometimes not!). But there are thousands and thousands of photos, updates, blog posts… what happens to all that content when I am no longer here? This is something I haven’t thought a lot about, and I’m sure you haven’t either. Which is why I think this book is so important for everyone. Vicki and Angela start the book out by taking a look at how we, as a culture, view death and dying. Let’s be real, it’s not exactly a topic that people like to talk about. It’s depressing! I certainly don’t want to think about my untimely demise, or about leaving behind my son. These topics are sad, they’re tender… and so we tend to push them aside. I had to deal with this a few years ago when I wrote my will. Okay, so just to be clear, I’m a 40-something in good health. I’m not dying (any more so than anyone else on this earth), but I am a single parent, and I didn’t want there to be any stress on my child when I died. I wanted to be sure that he was taken care of. The reality is, that losing his mother is going to be such a difficult experience for him (I’ve been there), that I didn’t want him to have to worry about other things, like money, or who he should live with. So I spoke to his father, and I got a will, and we set up contingencies. It was strange, contemplating my own death. But I did it for him. Because I love him and want to take care of him, even when I’m not here any more. It’s really worthwhile to get a copy of this book, if for the worksheets alone. It’s a great resource that will help you to organize your digital legacy, and then clearly spell out your wishes. Access. My first step is going to be to make a list of all of my digital assets (blogs, social networks, etc) and their login/password info. Obviously this needs to be stored in a secure place; either as a hard copy in my files, or in a password-protected file in the cloud. You also need to think about accounts you don’t use every day; like amazon, loyalty programs, that kind of thing. Wishes. Once you’ve cataloged all your digital assets, you need to decide what you want done with them. Thank goodness there’s a worksheet for that! Some social networks, like Facebook, allow you to create a “legacy” version of your account. Others you may just want deleted, or perhaps you want the account archived, downloaded, and then deleted. For me, I have many private conversations on messaging apps that I don’t think I’d want anyone to see, so those I will request to be deleted, unread. Set a digital guardian. For my will, I named an executor. That person is responsible for making sure my wishes are carried out. This person will be like your digital executor. They will need access to your wishes and also to your logins/passwords. Obituary. How do you want your death to be announced? What do you want said about you after you’re gone? For me, I think I’d like to write my own. But whatever you choose, there needs to be instructions, again. 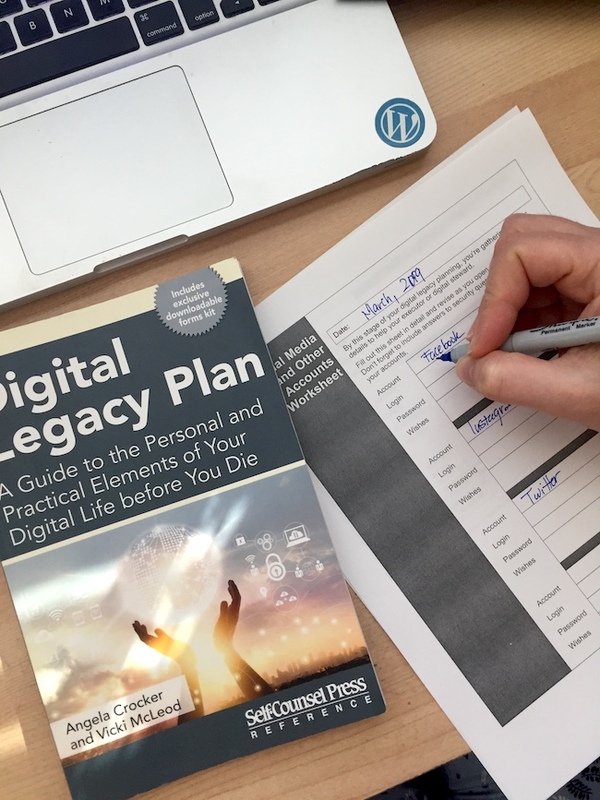 What’s your digital legacy going to be? This book was a real eye-opener for me, and I think it will be for you, as well. I highly recommend it. This is certainly a challenging topic for most, but that, I think, is exactly the reason why we need to be talking about it. Thank you for your book review, Rebecca. I’m so glad that Digital Legacy Plan resonated for you. Good luck with your own digital legacy planning. As you said, it will take some time to put it all together but it will be well worth it once you’ve got a plan in place.